New month (how is it December already?!) 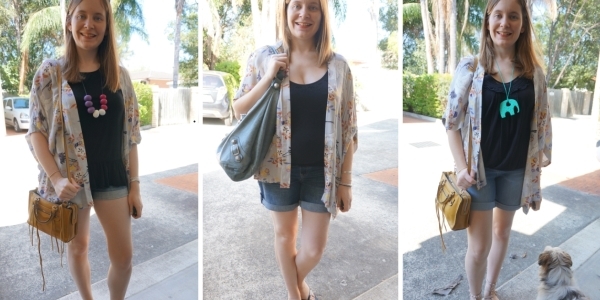 a new #30wears post, showing some different ways to wear this grey floral print kimono. When I first got this kimono in 2016, I wore it a lot. So much so that I was sure I'd hit 30 wears on it and was surprised at the end of that summer to realise I hadn't! 30 wears doesn't sound like that much for pieces you love, but as I've shared before, if you do the maths it takes 15 months if you wear something once every two weeks, which is probably more frequently than average. Math aside, I'm so happy with this kimono. It's a frequent go-to, especially paired with my mustard yellow Rebecca Minkoff bag, you'll see that pop up a lot in the photos below and I've previously done a 30 ways to wear a micro Regan bag post on that bag. I picked up this kimono in an ASOS sale 2 years ago and despite feeling like I frequently wear it, I'm just hitting 30 wears now. Quality wise, still looks pristine and new as the day I got it, no signs of wear. It was on sale for $33.60 when I got it so it's just over a dollar a wear at $1.12. It's full retail price was $95 so I'm pretty happy with what I paid and the low cost per wear! It was a great sale find. And as you can see below, a statement floral print kimono can actually be worn with a lot of different things! I find green a tricky colour to wear sometimes, but I've been making an effort to try wear it more often. While there isn't any green in the print of this kimono, with the florals and birds green just seemed like a nice colour combination to try. As you can see, I liked it so much I wore it that way a few times! While I enjoy wearing this printed kimono with bright pieces, nothing beats a classic grey tee. 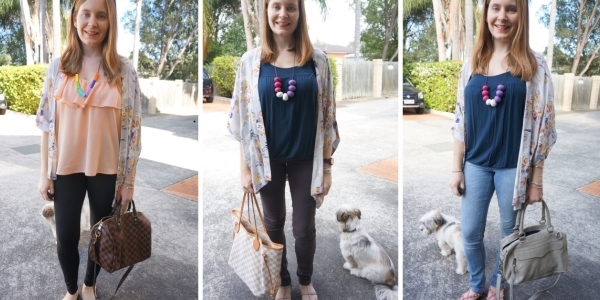 I used to be wary about wearing a grey tee and grey outerwear together, but I gave this kimono a try with a grey tee once and loved it - don't know why I'd never tried it before! The colourful print helps add some more colour and interest so it's not just grey on grey. 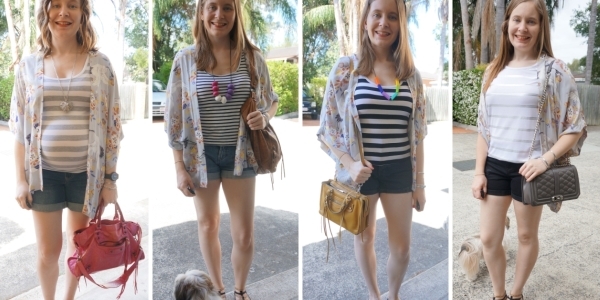 Colourful tops and grey tops are nice with this kimono, and black tops are perfect with it too! Adding a colourful printed kimono to a basic black top and denim outfit makes it instantly seem a little more pulled-together, and with the neutral top and grey base of the kimono it means you can add a colourful bag to your outfit. Picking an accessory that matches one of the colours in the print is a great idea, as I've done here with the mustard yellow micro Regan bag and blue Balenciaga day bag. Having a limited pregnancy wardrobe (and even implementing a capsule wardrobe for the third trimester) meant I reached for accessories more often. 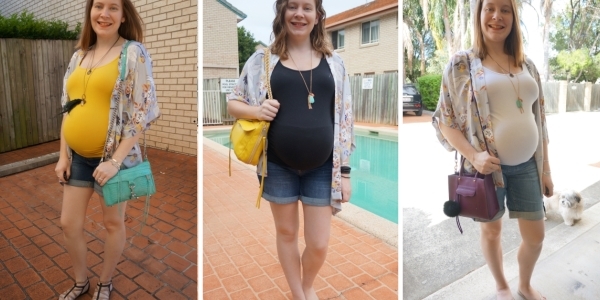 A kimono is a wonderfully lightweight piece that adds more interest and colour to your outfit, without making you any warmer, even while pregnant in a heatwave. 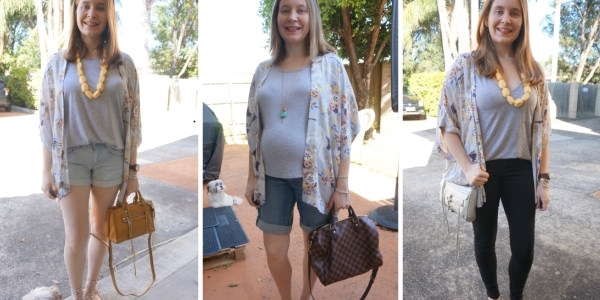 I loved adding this floral print kimono or one of my many other printed ones to an otherwise simple pregnancy outfit. 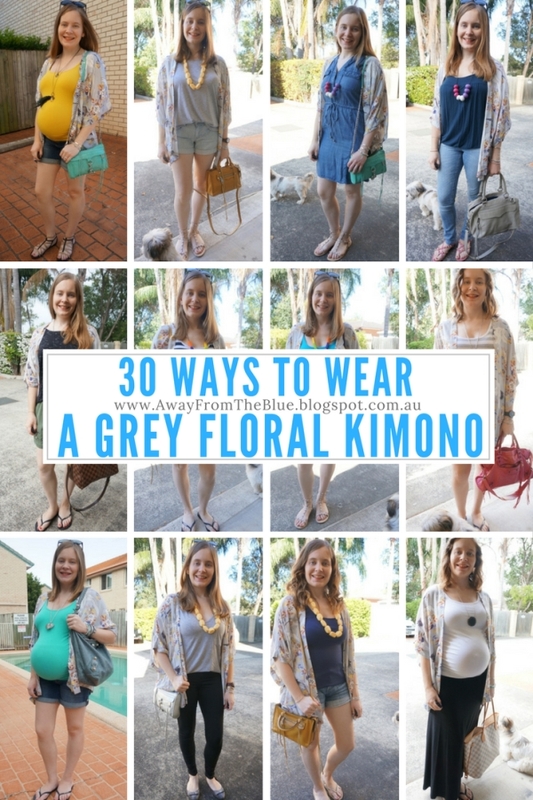 Kimonos are very bump-friendly too as you never have to attempt to fasten them up over a growing baby bump. They always fit, in every trimester! As a bonus, they work as a breastfeeding cover in the postpartum days too! 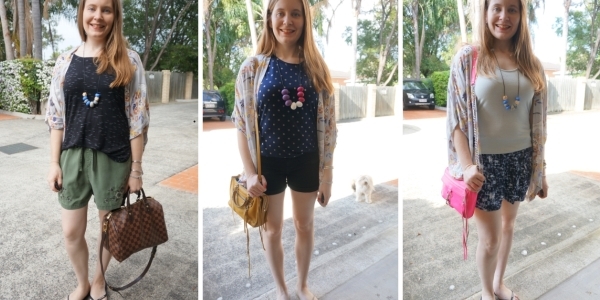 Denim shorts are a Brisbane summer essential - I couldn't do summer without shorts! 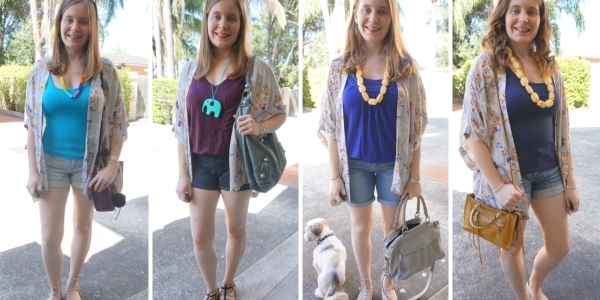 As you can see by how many times I've worn this kimono with shorts, easily the majority of the 30 wears! I love how nicely a floral print kimono like this works with denim - it's an easy, fuss-free option. As mentioned above, it's nice to have a light layer for summer that provides some sun protection without overheating too. Picking the right kimono is important to allow it to be breathable in the middle of the summer heat - viscose, cotton and modal are better than polyester. While they are great in summer, it's possible to wear your kimonos in spring and autumn too just by swapping out the denim shorts for skinny jeans. You can go for colourful jeans, or keep it simple and stick to the classic blue or black denim. While I do tend to wear this kimono with denim a lot, I do like to try different things with it now and then. Kimonos work just as well with dresses and skirts as they do with jeans or shorts. The first outfit with the maxi skirt is one of my favourite pregnancy outfits, the slouchy kimono and long skirt just work perfectly together. Florals and stripes is a frequently worn print mixing formula. I'm sure you've seen it around on blogs before, even if you've never tried it yourself. With the floral print on this kimono, I was eager to try it with stripes and I love the way this looks. You don't have to stop at stripes though! Embroidered floral shorts, polka dots or even abstract print, there are so many options. A good tip is to make sure that the prints have a similar colour. The gold polka dots and the yellow florals, or the similarly shaped floral print and floral embroidery together. While I dont always love the resulting outfits, I do have a lot of fun trying new things and wearing different prints with this kimono. How Do I Know How Many Wears Something's Had? I've had this question a few times lately. 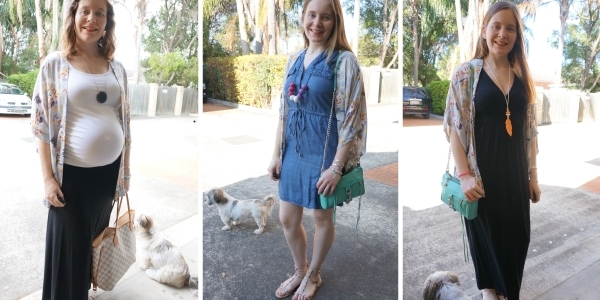 I blog what I actually wear - I take photos on my way out the door most mornings. That means if I want to know how many times I've worn something, I just look up the name of it on the blog and get a count. One of the benefits of having an archive of daily outfits for almost 6 years! This is my last 30 ways to wear post for the year and it's been an incredibly fun challenge - I know you all enjoy the posts too as they are some of the most popular on my blog, so I'm looking forward to continuing with it next year and making it a permanent fixture. It's been a challenge to hit 30 wears regularly, but identifying pieces I'm close to that number with and giving them lots of frequent re-wears is helping me hit my goals. Thank you for following along, the sweet comments, and the sharing and pinning of the posts. Linking up with Style on The Daily, Oh Hey Girl, Wardrobe Wednesday, Fashion Files, Fun Fashion, Fabulous Friday, Flashback Fashion, Weekend Wear, Passion for Fashion. I love kimonos, two years ago I went crazy and bought 5-6 kimonos but I wore them with everything!! Jeans, shorts, dresses, they are so versatile!! Love them! I have to say I just love that kimono paired with that mustard yellow tone. Such a stunning combination together. Also navy! BTW I'm super curious now about how much wear I am really getting out of everything. Though I have a feeling some of my more statement pieces won't be getting much use compared to basics like my black jeans from asos. I wear those babies religiously hahaha. Hi! I adore your kimono lookbook! It's a perfect versatile statement piece. The floral is great for the spring/summer season. Love how versatile these pieces are! Kimonos add instant flair to any look! It must be such a satisfying feeling when you hit the 30 wears. It's aa beautiful kimono. It is! I feel so accomplished when I get there, haha! It's a fun challenge! You have worn to perfection every time! It's so chic actually! I own one as well and it's one of my favorite pieces to wear!! Love! I love getting my CPW down and this piece still has a lot of mileage in it, so I can imagine the CPW will be even lower...! Nicely done Mica, and as you say, its one of the perks of having a blog, having evidence of wears. What a great testament to the versatility of the kimono. I had one that I wore until it was in tatters but I never replaced it and you've just reminded me of why I need one in my wardrobe. You must have hit so many wears with it before it fell to pieces! You really have worn that so many ways!!!! I never really know how often I wear stuff anymore since I don't go to the office every day I stopped doing my this week in fashion posts, so I only have a few pictures per week, haha...oh well. This is such a pretty piece! I love how you styled it so many ways! Wow you styled it so many ways and each look looks so cute!! I love that kimono. Oh I've always wondered how you keep track of how many wears, thanks for sharing that! I love this kimono and your kimono looks are what make me always want to get one. You prove that it's such a versatile wardrobe item! Wow, I had no idea that 30 wears is actually quite a lot for a piece! Here I am thinking I wear all my clothes a lot, but now you've got me second guessing, haha! Hope you have a great rest of your week, Mica! I do remember seeing and appreciating the very many kimonos that you have styled in the last year. Whether you were with the baby bump or without I think you did an amazing job. I love the kimono as a fashion accent it is such a simple way to add an elegant or fun layer, I also love the list that you shared with us and find it very helpful now as it is getting very close to giftgiving season. I know that kimono! I love it and you have styled it so many different ways. Such a great piece to have in your closet! How cool that you've archived your outfits to remember later! I would probably be more aware of how often I've worn a shirt if I did that. Lovely necklace and kimono! I like how you've documented the frequency of wears--you've shown some great alternative here! Wow, I think you did a great job. I have that Tarte blush and love it. Ooh I love this kimono! Looks so good as a light extra layer and perfect for Pregnancy. If I wasn't having my baby next week I would definitely invest in one! I really wish I did daily photos myself! I bet it's fun to look back at how your wore things and I think it's great to have a count of how many times you wore it! I love the kimono I think It's a really great piece because the colors match with everything . Well done on 30 wears, Mica! I think I like it best with the green tops, because it shows the lovely pattern off. I think I wear most of my clothes way more often that every two weeks, most of them get worn at least once a week. But my wardrobe is very small, so I don't have that many options. Yes I think my biggest problem is my overflowing wardrobe, haha! WOW, how versatile is this kimono! I love all the ways you have styled it! That's definitely a really versatile piece - I love how it looks paired with a black maxi dress. You are the kimono remix master! Love this! Hope you have a lovely weekend ahead, girlfriend! I was wondering how you kept track of your wears for each item, I thought maybe you had some sort of proficient spreadsheet! But, I guess keeping track on the blog is an excellent way to keep track! Its amazing how flexible a kimono is, you can style it so many ways which you've shown here! I only have one kimono, but I love seeing the versatility of them! You have really gotten a lot of wear from this and worn it so many different ways! I'm pinning this for summer! It is a great challenge to try! You can watch the documentary 'the true cost' if you want to know more about it, it's free on netflix. Gotta love kimonos!! So versatile for sure! Lovely outfits here. Oh wow! Mica, this kimono was certainly a great purchase, and at that price...dang! I love the ways you styled it. I have a kimono I wear a lot too...well, mostly in summer/spring:) I do so wish we have your weather. PS I have trouble wearing green too just in general...don't know why. It's just one of those tricky colours for me! 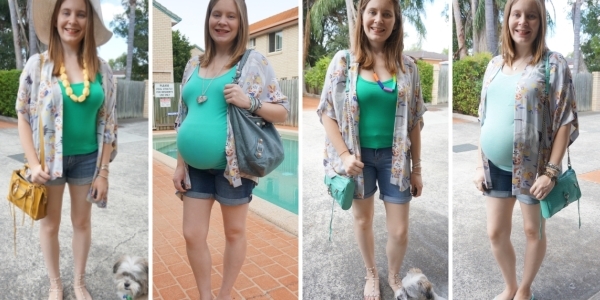 Aw, so nice to see the bump again in some of these looks! I love the way you've styled the kimono in each look. This post goes to show that because something is printed, doesn't mean you don't have many options on how you can wear it! Thanks for the inspo and I hope you're having a great week so far! Your photos are wonderful! Great outfits! I have to show this post to my co-worker because she is absolutely in love with birds!You always have the most versatile looks! I love how many options you share when you style an outfit. Really gets the wheels turning in my head for new outfit ideas! I love that you wore the cardigan 30 different ways. It just shows that you don't need a lot to have different and GREAT outfits! Love this! It's a beautiful kimono Mica! You've shown that you can practically wear it with anything. So versatile. It compliments all of your outfits. That is such a perfect piece to mix and match with many different looks! I absolutely love the pattern combining that you did, and the way it looks with your green shirt. Love these looks! Thank you for linking up this week! I need to pick one of these up! I love how it worked with your growing belly. Btw you look so cute I hope to look this cute!! That kimono looks great. I love the fact that it is so versatile and you can wear it with many looks! Oh I love this kimono! It's so pretty! Styling it with the shorts is my favourite!